Katerina Ring was born in Coronado, California in 1967, and the town has been her home base in the USA ever since. She now lives and works primarily in Zambia, with a few months in Italy annually. 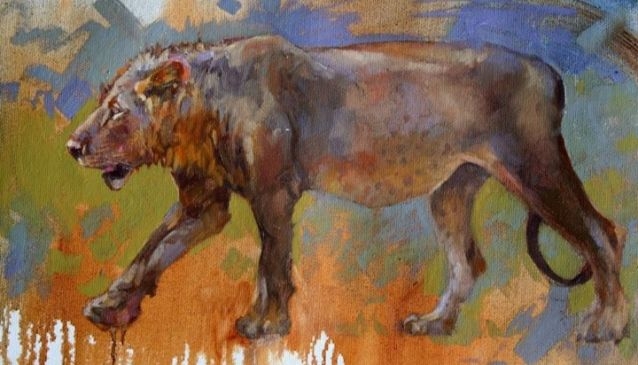 Her subject matter and media have evolved in the past 20 years from very detailed Tuscan still lifes in watercolor to pastel landscapes on textured surfaces, to semi-impressionistic and abstract oils of animal and plant life. Throughout, there has always been a graphic element to her work, and an obvious love for rich colors. Kat's art education was in graphic and textile design at the University of California, Davis. She continued, postgraduate, through the University of Georgia in Cortona, Italy and has studied drawing and painting in Florence and Germany. She continues to study with master painters at Scottsdale Artists' School in Arizona, whenever she is in the USA. The Italian paintings aim to honor the architecture (and it's harmony within the natural surroundings) of centuries of genius and craft. The work produced in Zambia ties together two life's passions: design and animals. Kat aims to express her wonder at these two worlds, and create awareness and appreciation of history's importance and nature's fragility. Katerina offers these workshops. 6 participant minimum.